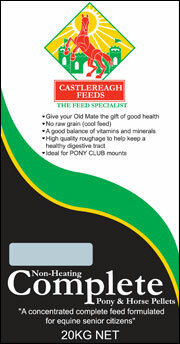 The older horse has special nutritional needs, Castlereagh Complete pellets are a steam conditioned, pelleted, nutritionally balanced complete feed formulated to be feed with quality roughage (hay/chaff/pasture). 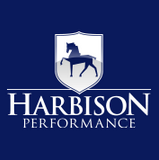 The steam conditioned pellets can be softened in water to produce a highly digestible porridge ideal for cold winter days, horses with worn or missing teeth and those recovering from surgery and illness. 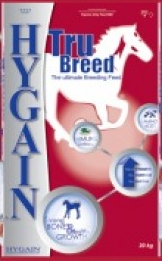 Additionalsupplements are not required except on veterinary advice. Steam Conditioned Barley, Bran, Pollard, Lucerne Meal, Hominy Meal, Molasses, Vegetable Oils, Salt, Mineral Salts and Castlereagh’s Vitamin & Mineral Pre-Mix. Calcium as carbonate, Phospherous, Magnesium, A, D3, E, K, Calcium Pantothenate, Folic Acid, Niacin, B2 , B12, Niacin, B6, B1, Choline Chloride, Bioton, Cobalt as Sulphate, Iodine as Potassium Iodide, Selenium as Selenite and Selenium Yeast, Copper as Sulphate, Iron as Ferrous Sulphate, Manganese as Sulphate, Zinc as Oxide.